Why is biodiversity important to ecosystems and people? 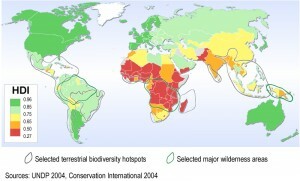 Home > Extra information > Why is biodiversity important to ecosystems and people? Ecosystems are composed of complex relationships between organisms and their physical environment. These relationships are constantly fluctuating, and are rarely predictable. This relatively simple concept has eluded western scientists until quite recently. Ecosystems have been treated like machines that will supply our needs as long as some basic conditions are optimized. For example, species deemed to be undesirable are removed and replaced by commercially valuable species that are “harvested” at constant rates. This however ignores the complex relationships in ecosystems and the importance of biodiversity, and has had some catastrophic consequences. Different species fulfill important functions within the ecosystem. For example, they may be photosynthesizers, decomposers, herbivores, carnivores or pollinators (see figure below). In ecosystems that have many species that can fulfill a given function, the ecosystem is more resilient. In other words, it is able to respond to disturbances such as disease or fire without collapsing. This apparent redundancy is a very effective insurance, for if one species succumbs to a disease, its “function” in the ecosystem is taken over by another species. Ecosystems with limited diversity, including monocultures (areas entirely dominated by a single species, as in most agricultural crops), are much more prone to disease than diverse natural systems. The value of the world’s ecosystem services has been (conservatively) estimated at $33 trillion per year. The state of New York discovered that wetlands and other natural systems in the watershed accomplished water purification and filtration that would require an $8 billion water treatment plant to replace. Protecting and remediating these natural systems cost much less. Over 75% of staple food crops and 90% of flowering plants worldwide depend on pollination by insects and other animals. Between 100,000 and 200,000 species of animals act as pollinators, and their populations are declining. Crop diversity is substantially falling as agri-business is taking over food production from small family operations that once supplied our population. The practice of saving seeds is being abandoned in favour of hybrid varieties that require reseeding every year, as well as large amount of chemicals. This trend affects the self-sufficiency of farmers worldwide. Reduction of genetic diversity of food crops makes these crops more susceptible to disease and pest outbreaks. Non-timber forest products such as wild foods, floral greens, herbal medicines and edible and medicinal mushrooms may be sustainably harvested from a healthy forest. If carried out with respect for the environment and for First Nations knowledge, this emerging industry may be worth many millions of dollars to the economy. These plants and fungi are part of natural diversity in forests, and are less abundant in areas that have been clear-cut. Virtually all natural and pharmaceutical medicines are composed of (or derived from) natural compounds of plants, fungi, microbes and animals. In areas of severe environmental degradation, many species with known or undiscovered healing properties are threatened with extinction. The highly biodiverse coastal environment (of Br. Columbia) contributes 4.5% to the provincial GDP. Many people also believe that plants and animals have the right to exist, that they have value in and of themselves. This intrinsic value does not depend on any utility for human benefits. In summary, the known and unknown species of the world may one day provide us with answers to questions we do not yet know how to ask. Given how little we know about how nature functions, preserving biodiversity is an important investment in our future, and a priceless gift to future generations.